Water-tight chrome plated brass. 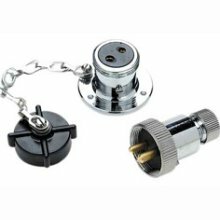 Brass double contacts supplied complete with black plastic threaded knurled cap and chain. Insures positive watertight fitting. Fasten with #6 screws. Flange diameter 1-1/2". Overall length: 2-3/4". 3A @ 12V.